VETERANS' VICTORY HOUSE - Home of the Greatest Generations. Eligibility for admission into the Veterans’ Victory House is limited to three main criteria. We would like to encourage you to apply for admission to the Veterans’ Victory House if you or a Veteran you are responsible for is currently in a skilled care setting or feel that it may the right place. Please feel free to schedule a visit or call to request additional information. Admission to the Veterans’ Victory House is an honor and a privilege that our Veterans have earned. For a full admission packet, eligible Veterans, family members, or representatives should contact the Veterans’ Victory House directly at 843-538-3000. Once the admission package is received, please follow the following and enclosed instructions closely to expedite the process. Copies of the veterans DD214, and any applicable Advance Directives, to include Power of Attorney and Living Wills. Once paperwork is submitted, the Admissions Nurse will schedule an assessment of the Veteran. The Veteran/family/responsible party will be contacted shortly after assessment to be informed if the veteran meets criteria for nursing home placement. If the Veteran is accepted, he/she will be scheduled quickly for orientation and move-in or placed on the waiting list and will be contacted as soon as a bed becomes available. The Veterans’ Victory House is a facility unlike any other in the Lowcountry of South Carolina. It has been built for the sole purpose of allowing eligible Veterans to receive a great benefit that they have earned for their service to the Nation. 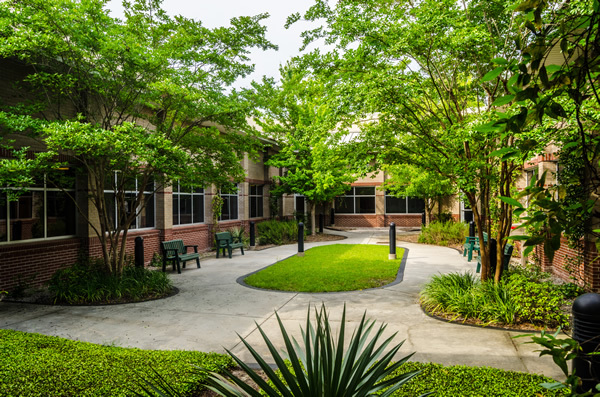 Owned by the State of South Carolina, operated by HMR Governmental Services, and partially funded by the United States Department of Veterans Affairs, this facility honors our Veterans’ service by providing the highest level of care in a highly desirable setting. Veterans Home cost includes room and board, nursing care, dining and nutritional services, laundry services, barber shop, salon, housekeeping services, phone and cable, and basic personal items such as briefs and toiletries. efs. The Veteran is responsible for daily co-pay, as determined annually. A High Service Connected or Priority 1 – 70% or greater Service Connected disabled Veteran may be entitled to the full cost of veterans home care. The veteran is also responsible for the Veterans’ Victory House contract physician cost, therapy, labs and medications. Unless otherwise provided by the VA, the charges are billed to the veterans’ insurance coverage, such as Medicare, Medicaid, supplemental coverage, Tricare and Medicare part D coverage for medications. Please call the Veterans’ Victory House today to discuss rates, benefits, and eligibility! There is absolutely no better option for a Veteran in need of skilled or intermediated skilled nursing care. Copyright 2019 HMR Governmental Services. All rights reserved.